"Claire packed so much into her 27 years with us. She was a daughter, a granddaughter, a sister, a cousin and an aunt. She was a student, a volunteer, a musician, a dancer, a dentist, and a Naval Lieutenant. She was these things and so much more. Somehow, though she had many trades, she mastered them all. I could not have been more proud to call her my little sister. It always amazed me that she could excel academically while managing to fit so much community service into her spare time. Through her talent, hard work and good choices, she was able to graduate from both undergrad and dental school without paying a dime of tuition. From a remarkably early age, she involved herself in community service projects both big and small, from baking cookies for her neighbors to raising money for South African orphans. Somehow she found the free time to do all of these things. As a relative said the other day, I'd have had free time in college too if I hadn't been drinking beer and playing pool. Claire had better things to do. I often told her how impressed and proud I was of her achievements and good choices. In fact, I told her that so often that I think it really started to embarrass her. But her achievements are only part of her story. And I wish I had thought to tell her then what I am about to tell you now. Claire was one of the most fun people in the world you could hang out with. I don't think I ever told her that, but it's undoubtedly true. There was nobody better to be goofy with. Whenever the family was together we would tease each other with silly inside jokes, dance around ridiculously, and sing like cheesy lounge singers. I'm sure every one of her friends in this room has similar memories with her. I'd love to hear every one of them later on at the reception. Taylor and I would do anything we could to make Claire laugh, even if we knew we would likely face what we called "the wrath" as a result of our jokes. In fact, one of the most famous quotes in our family, "sit up, scoot up, and shut up" was the result of some particularly zealous attempts by Taylor to make Claire laugh at a family dinner in the Terre Haute Olive Garden. Any trouble we found ourselves in was nothing compared to lighting up the face that always lit up our lives. She was the shining light of our family, and that would have been true had she never achieved anything of note. She brought so much joy to every single member of our family; I think it's safe to say that she was everyone's favorite. She was the best of us. Though we will remember her achievements always, we will miss Claire, our sweet, silly shining light." Today's #TributeTuesday is a sweet remembrance from Ben Wedeking. Thank you so much for sharing your thoughts and memories of Claire. "I was disappointed to break a dish of my late grandmother’s last Thursday night while I was cooking. It was a small bowl, off-white, with sides that flared out instead of rising straight up, and it was painted with a leafed oak branch. The issue was I had a teapot and a soup pot on the stove while I was cooking, even though they weren’t needed. The action was happening in the skillet and saucepan, and my foolish plan to perch the skillet’s lid on the soup pot resulted in a big mess when the lid fell, knocking my grandmother’s bowl from the stove to the floor. I collected the broken pieces and left them on a plate on my kitchen table, still dirty with food and grime from my floor. Though I have another identical bowl, the thought occurred to me that I could try to find an artist who does Kintsugi, the recently-internet-popular Japanese art of repairing broken bowls with metal-mixed lacquer. My mother arrived on Saturday and when I told her of the bowl, she encouraged me not to worry, my life would be so different from my grandmother’s. I’ll probably get rid of the shards. On February 18th a year ago, I made cinnamon rolls for the first time, trying to be affirmative about being more like Claire; cinnamon rolls were a specialty of hers. My father was visiting, and he was sitting at the kitchen table while I rolled out the dough on the table’s other end. Not noticing how close his water glass was to the table edge, I threw the rolling pin to the dough time after time until the glass fell to the floor and shattered. I grabbed some tools and got on my knees to start sweeping up the pieces. That glass, simple but cheerfully adorned with lemons, was one I kept from the time I lived with Claire. I cried, and Dad didn’t need to tell me my life would be so different from Claire’s. Sometime in 2013, I was helping Claire cater a reception for a student recital at Indiana University in Bloomington. I would occasionally offer an extra arm to stir, but mostly I was entertaining myself in the living room while the alchemy happened in the kitchen. When all was prepped, I helped her load up the car and we drove off, a bit late. When we parked across the street from the venue, Claire loaded up her arms with so much that I warned her. She almost made it, but the sausage phyllo rolls fell and the dark blue serving bowl broke into pieces. I told her she tries to do too much, and it wasn’t until she apologized to the recitalist’s mother that she started to cry. I never apologized to Claire for scolding her, but I’m so glad she never stopped reaching. My grandmother lived to be 95. She had six grandchildren and some of the next generation too. Sometimes I’m upset that Claire missed the opportunity to build a tree. I wonder about the dishes she would’ve passed down to her grandson. Other times I’m upset with myself, remembering easily that I scolded her, or that I broke up with her, leaving her to wander into a violent world. The pure loss settles in too, when I realize I lost my friend, someone who knew me fully, a great dancer, an imaginative mind, a musician, a dentist and all the other things she was. Though I remember how heartbreaking it was to lose that lemon glass that fell to the floor a year ago, I’ve recently chosen to part with another gift from Claire, a heavy 12-inch skillet. The non-stick coating is long past the point that justifies continued use, and Claire herself would certainly disapprove of using the pan at this point, savvy as she was about public health concerns. So I went out and bought a new skillet, a brand new Calphalon one with a lid. Maybe it’s some solace that the skillet that replaced Claire’s was the one that broke my grandmother’s bowl and brought to mind all these memories. Even more so since I was using the new skillet to make a sauce from roux, a skill Claire taught me. She shaped my life by her gifts, her teaching, her words, and her love. As best I can, I’ll let her lessons and her life ripple through mine. For the few things I still have that were hers, I’ll treasure them while they last." "It’s been a tough day at school/work/practice, and you see them. Your favorite classmate/co-worker/teammate that brings you so much joy walks in the room, and you already feel more at peace. That’s who Claire was for me. A friend and classmate who brought so much joy and laughter even on a difficult day. She loved others deeply-- her family, friends, patients, classmates, strangers. I heard her stories of you all, and she had some pretty hilarious and wonderful people in her life. She was a listener. She would ask someone a question about themselves and take in their response with so much respect. She’d hear you make a comment that you love anchors because of a favorite verse of yours, and months later, she’d get you an anchor charm for Christmas. She was someone who celebrated others--with kind words, cards, congratulations, cupcakes, and showers. She was full of empathy. Even the most calloused person could leave Claire saying, “Maybe there’s something going on in his/her life that we do not know about.” She was a doer. Claire juggled dental school, being a Big Sister, volunteering, working at her church, and her time with family and friends as gracefully as her dance moves were. Looking back on the way she lived her life, I have learned that it’s important to not just speak kind words to people; we must do for others. 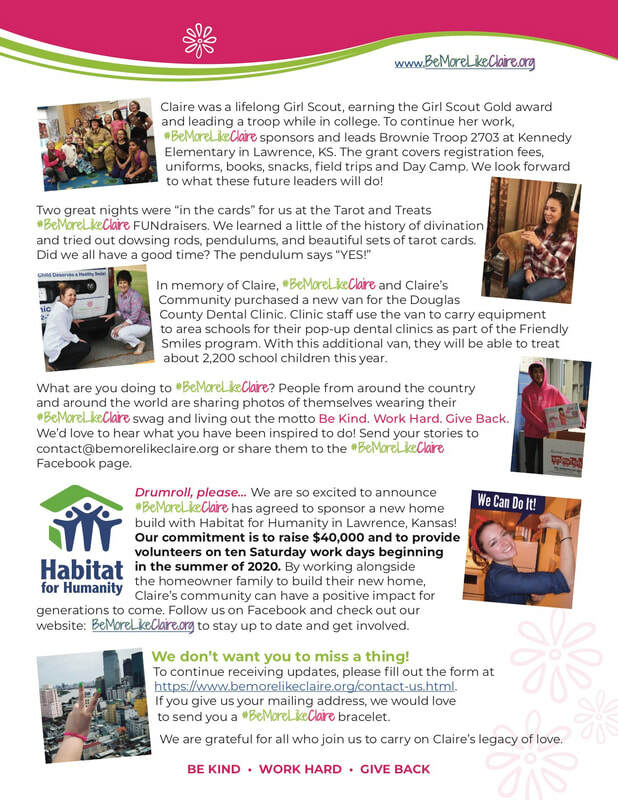 Claire loved her community and took action as a response of her love. Thank you for believing in me, for your silly impressions, for making me laugh in the lab at midnight, for Just Dance parties with Jerry, for your baked goods, for your listening ear, for attempting to scare our classmates, for saving me my favorite Panera bagel when AAWD was selling them in the mornings, for dinners, for trips to the park, for picking me up when I was afraid to drive in the snow, and for showing all of us what it looks like to use our hands, feet, and hearts to give away kindness. I hope you know just how loved you were, Clairebear. " 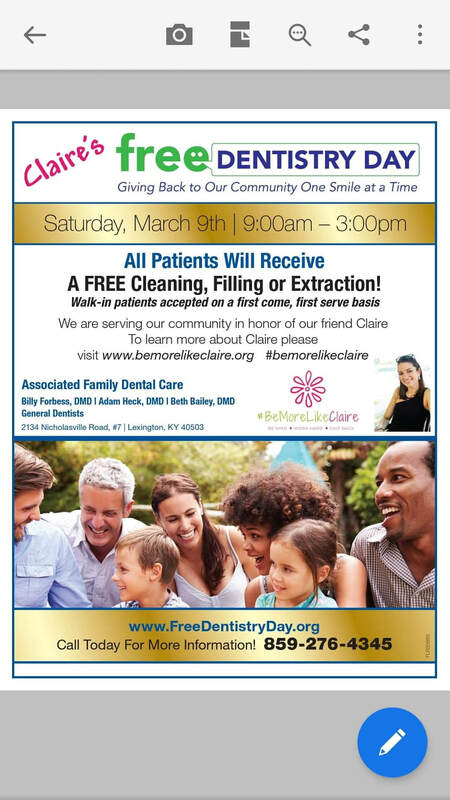 "Join us for our Free Dental Day in honor of one of the most beautiful, selfless people I ever had the pleasure of knowing. Claire was an amazing person who always put others before herself and wanted to help everyone in our community. 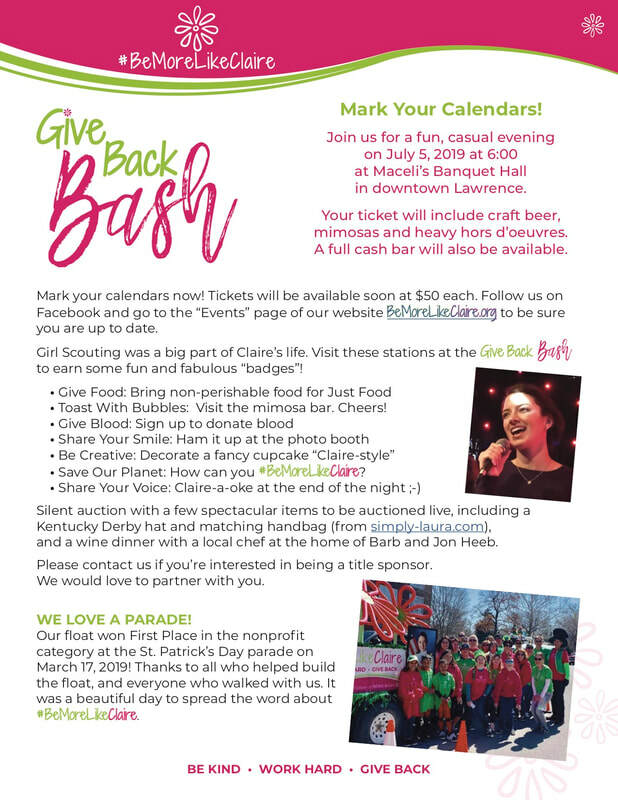 If you're in the Lexington area and are in pain/ in need of dental treatment and can't afford it, please come see us Saturday, March 9th! #bemorelikeclaire"